Former Treaty Minister and National MP Chris Finlayson is planning his departure from parliament before the end of year. Finlayson has spent 13 years in the Beehive and nine in government, during which time he saw through 59 Treaty settlements. The first reading of the Ngāti Tamaoho Claims Settlement Bill was held in Parliament today. 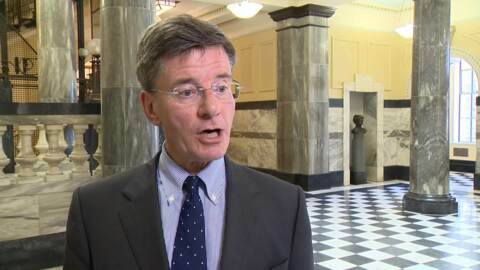 The Ngāpuhi treaty claim is at a stand-still after Prime Minister Bill English advised Te Kotahitanga and Tūhoronuku that the government will withdraw from the tribe's treaty settlement process. Nanaia Mahuta has rejected claims that she and Treaty negotiators met in Kāwhia without local iwi knowledge. The Minister of Treaty Affairs Chris Finlayson says the future of the Ngāti Rehua Settlement Deed is firmly in the hands of its people. This follows robust and heated exchanges at meetings to ratify a deal that will see Ngāti Rehua cede sovereignty to the Crown. Travelling the widths and breadths of New Zealand has been an eye-opening experience for Minister of Treaty of Waitangi Negotiations, Chris Finlayson. A position that has seen the boy originally from Wellington step foot deep into the heart of Māoridom. A group of hapū from Northland are hoping to get the mandate to undertake their own treaty claims.